Call Margo Green, Berrien Property at 269.362.9595 for your private showing. 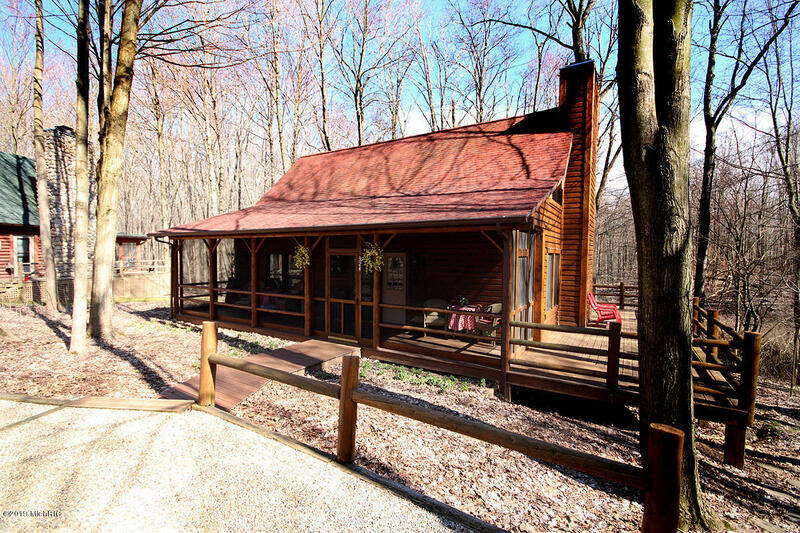 Beautiful log cabin nestled on 147 acres of woods and overlooking natural pond active with wildlife. You will be intrigued as you walk up the new boardwalk entrance and see the new roof, new railings and freshly sealed logs. Enjoy views from the cozy interior, outside wooden deck or screened porch. This home features 2 bedrooms and 2 baths, hardwood floors, updated appliances & a beautiful stone wood-burning fireplace. A private sandy beach area offers kayaking, paddle boarding, swimming & fishing or just lay back and read a book. This gated community with full-time on-site caretaker is close to Lake Michigan beaches, park & attractions. If you like great wineries, restaurants, shopping or small town charm, look no further.